If you are in the Cincinnati, Ohio area, then gather together your children and grand children, neighbors, and friends, and come to the Patriot Fair! 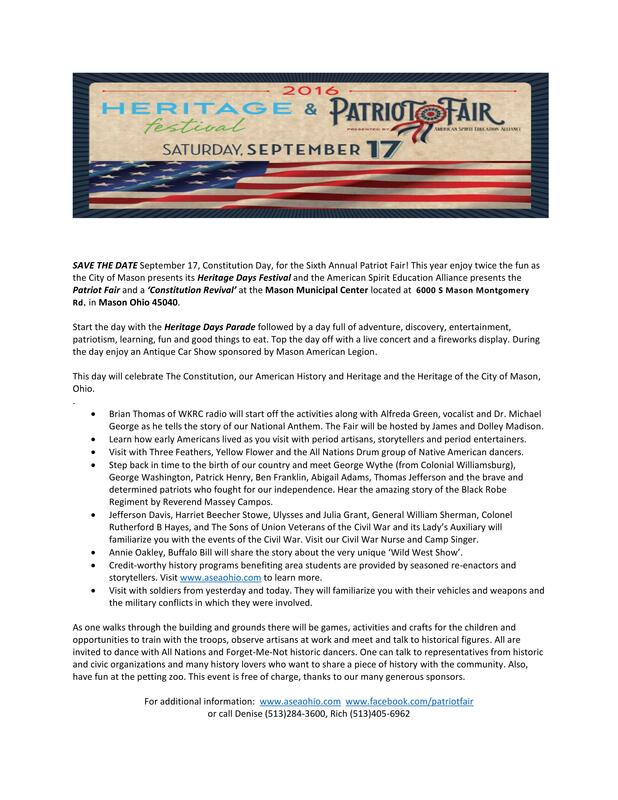 It’s the Constitution Day Patriot Fair in Mason, Ohio on September 17, 2016. I’ll be speaking twice. I would love to meet you. It will be a fun filled family day with a profound purpose. And I have been informed that Mr. and Mrs. James and Dolley Madison will be there. My appearance has been cancelled. Yes, some objected to my being allowed to speak about the Constitution at this “Constitution Day” event in Mason, Ohio, so I won’t be there.